MultiBrief: Treadmill vs. road: Which is better? Treadmill vs. road: Which is better? For some people the treadmill is boring and lacking visual cues to remind them of their progress — for example, passing a landmark or catching up to another runner, etc. Since they are still physically in the same place on a treadmill, they can't see how far they've moved. Many people struggle with this. The ability to stop at any point is also a constant reminder in the form of a big red stop button. For those who struggle with motivation, this can be a big problem. Out on the road, a runner may be still some distance from home when the urge to stop takes hold, so the run continues. On the other side of the fence, some runners prefer a treadmill run as they can see the miles literally tick off in front of them. They may also feel they would be more motivated to run in less-than-favorable weather conditions if they do not need to go outside to do so. Winner: It's a tie! The psychology of treadmill vs. road running is a subjective thing that comes down to personal preference. Running on the road has been shown to be physically more demanding than treadmill running at the same speed. The main reason for this is wind resistance. There are other factors that also make the road more tricky — an uneven surface, for example — plus the fact that the surface is not moving and assisting with forward propulsion. A study by Exeter University back in 1996 demonstrated a small increase in energy expenditure when running on the road rather than a treadmill. But what the researchers also showed is that this difference can easily be nullified by increased the incline on the treadmill to just 1 percent. Winner: It's a tie! While the road is more demanding due to external factors such as wind resistance and potholes, when we're talking purely about energy expenditure there is no significant difference when a small incline is added. The key benefit here is specificity. There aren't many running events that take place on a treadmill. If you're training for a road race, you need to do at least half of your training on a road. This prepares you fully for the task ahead — acclimating you to weather conditions, wind resistance, uneven road surfaces and the like. However, the treadmill can be a handy training tool for road running events. It allows you to train even when the weather is hideous. Incorporating speed training sessions and intervals can also be easier on a treadmill. Those who struggle to stick to a set pace on tempo runs can also benefit from treadmill sessions. Winner: It's another tie! Both road and treadmill runs can have their place in the run up to a race event. 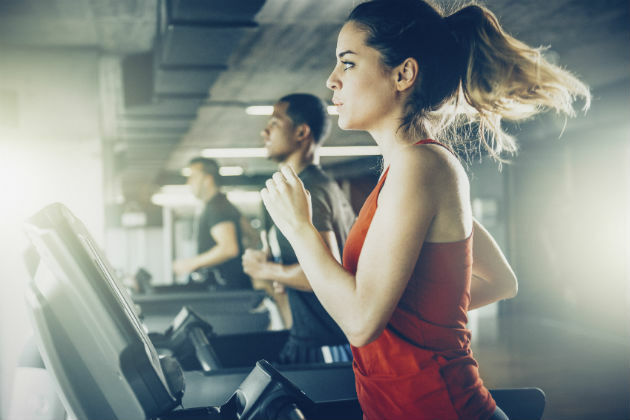 Some people find the issue of a moving belt quite daunting, and having worked and trained in gyms for many years, I have seen treadmill-related accidents occur. For those with compromised balance, the road is definitely the way forward. Generally speaking, though, treadmill running is safer than road running. There are no cars, cyclists or even other pedestrians to deal with. No slippery pavements, curb stones or rogue items dropped in your path. There is good lighting at all times in the gym. The weather is not going to suddenly decide to throw tennis ball-sized hailstones at your head, blow you over or strike you with lightning when you're indoors on a treadmill. Winner: Treadmill. This one's a no-brainer win for the treadmill. Most people come to grips with the treadmill quickly, and accidents are rare. There are certainly many more risks when running outside, although running is still a safe activity. Again, the key here is specificity. If you are returning to road running after an injury, then you will need to run on the road to fully regain your preinjury fitness and strength. However, the treadmill can be a great tool to use in the early stages of a return-to-running program. You can easily control the intensity and duration of runs, and you can hit the stop button at any point if you feel pain — not so easy if you're already a mile or two down the road. With ankle injuries, for example, the flat surface of the treadmill means lower activation of stabilizing muscles, such as the peroneals. In injuries like peroneal tendinopathy, an initial return to running on the treadmill may be a good bet. Winner: Treadmill. Even if you don't usually go anywhere near a treadmill, they can be great for that "just getting back into it" phase. Many road runners believe that running recruits a higher proportion of muscle fibers and promotes a more natural gait. It's easy to see where this theory comes from as the moving belt on a treadmill could be seen to do some of the work for you in aiding forward propulsion. But there is little evidence to support any of this. Research has produced mixed results, with some runners dramatically changing their running gait and muscle recruitment patterns from road to treadmill, whereas others don't alter much. The changes seen also vary from runner to runner, with some increasing their stride length and others shortening it, for example. Winner: It's a tie! This one comes down to a lack of solid evidence and mixed results from those studies that are available. Future research may swing it one way or the other. Running outside, especially in green areas of natural beauty has been shown to increase feelings of positive engagement, revitalization and energy levels, as well as reducing tension, anger, confusion and depression. Those who run outside also claim to enjoy it more and are therefore more likely to continue with the pastime. Any form of exercise can have a massive impact on your sense of well-being and your mental health in general. Most treadmill advocates would argue that if they find the treadmill more appealing, they are more likely to exercise and so more likely to reap these benefits. Winner: Road. Running outside is proven to have more benefits for your overall well-being than running on a treadmill indoors. If you're counting the wins, it seems the treadmill actually just sneaks a victory using these parameters. But, really, it's too close to call. Both have their pros and cons, depending on the aspect of running and training we're talking about. Personal preference plays a massive part, and neither one camp nor the other is wrong. My advice is to be open-minded. Use both tools if they are available to you, and pick and choose the more appropriate form of training for the day in question.